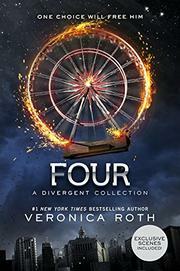 Roth returns to her wildly popular Divergent series with four prequel stories from Four’s viewpoint. Before he was “Four,” he was Tobias Eaton, the abused and alienated son of Marcus, leader of the Abnegation faction. The stories (really one episodic novella) trace his path from the choice to join Dauntless to his first encounters with Tris, heroine of the trilogy and love of his life. Sufficient information is interwoven to make the world accessible to new readers, while fans will find a surreptitious thrill digging into a taciturn hero’s back story; still, little of real consequence is added to the overall plot. Devotees will undoubtedly relish cameo appearances by several beloved (and loathed) characters, and they will squee over such iconic moments as Four’s earning his nickname, getting his tattoos and learning the dangers of being “Divergent.” More compelling is his gradual transformation from an angry, manipulated and vulnerable victim to a badass loner—still angry and bitter but now tough and determined. Unfortunately, this narrative arc is undercut by the final story and the three rewritten short scenes from the first book, which read almost like bad fan fiction: Once Tris appears, the love-struck Four becomes dithering and goony, gushing about her all-embracing awesomeness and explaining that all his harsh words and actions really meant their exact opposite.